Opening times Sat & Sun, half term, school holidays and bank holidays: daily 10am–5pm. Seasonal times During term time: Tue–Fri 10am–4pm; closed Mon; Dec 24–26 & Jan 1. Eureka! The National Children’s Museum is an extraordinary fun-packed day out for families. 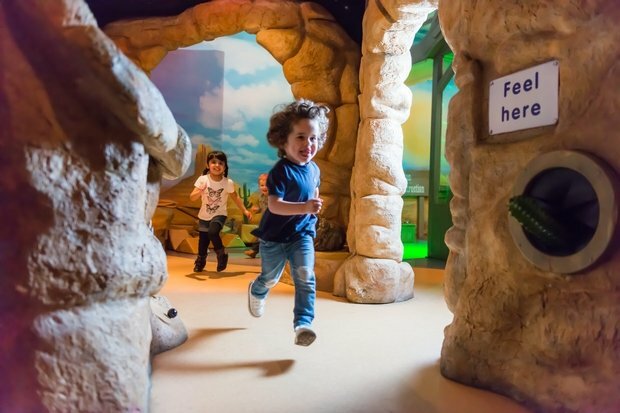 We are the only fully interactive museum totally dedicated to children aged 0–11 anywhere in the UK. Nothing is behind a glass cabinet! We have over 400 interactive, hands-on exhibits designed to inspire enquiring minds to find out about themselves and the world around them. Discover six unique zones each with a different theme to explore. Make some noise and explore how music is created, experience the world of work and take over a child-sized town, and step inside giant body parts. Each zone is packed with equipment to explore, activities to do, and buttons to press. And with plenty of events throughout the year, from science experiments to interactive shows; it’s a different Eureka! experience every time. Pay once, and get in free for a year with an Annual Pass. A chance for kids to play. A special programme of activities suitable for all ages to mark the annual day of Children. An exhibition mixing digital technology with mechanical machines. Science demos with a steampunk vibe. Looking for events in Halifax?